Smart contract pioneer Clause has partnered with ConsenSys company Kaleido, a new platform designed to help businesses ‘easily’ and cheaply create their own private blockchains in conjunction with the Enterprise Ethereum Alliance and Amazon Web Services. 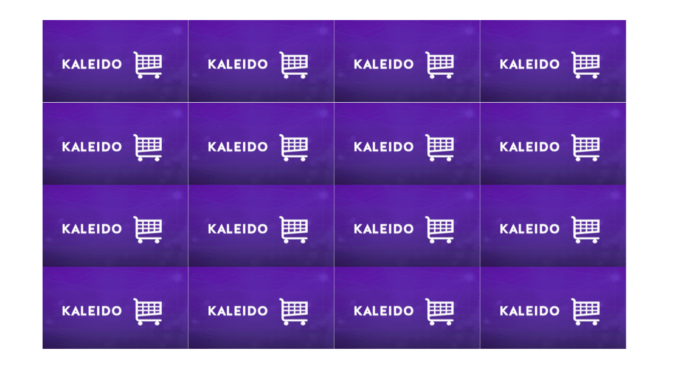 This will be an important step if Kaleido, which can be seen as ‘a managed Blockchain-as-a-Service offering’, gets traction in the wider business, and commercial legal, world – because the platform is designed to do one thing: make it much easier for companies to turn their consortia of blockchain enthusiasts into members of a real, live, working blockchain. 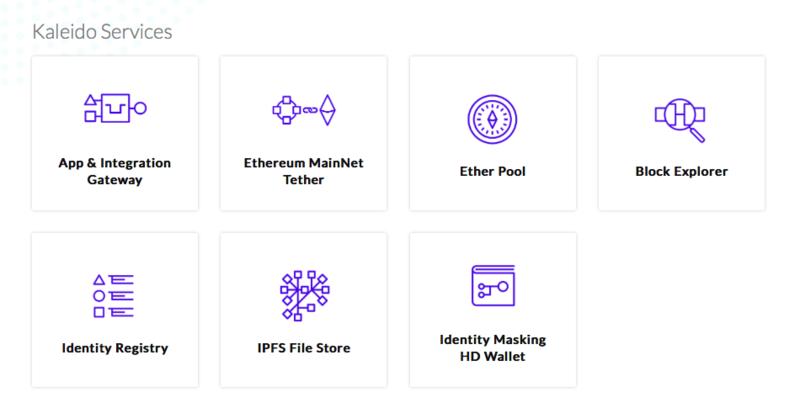 It does this by providing a relatively simplified (but not that simple – see below) interface for people with experience in this area to quickly create a fully functional private network on Ethereum. Then it offers, via a marketplace, a suite of tools and applications that will bring this network to life. As, after all, there is no point having a nice new shiny network if you don’t have the tools to do anything useful with it. So, in this case, Clause will now also be available ‘on tap’ for users of the Kaleido platform. It should in theory be as simple as: 1) find a group of companies/law firms that want to be part of a blockchain, 2) build the network via Kaleido, 3) start using the applications, such as Clause – but also rival smart contract company OpenLaw – from its marketplace and you’re fully operational, if you want that. Some of the companies offering their applications on the marketplace. Note the availability of Chainlink, the fiat to crypto oracle, making life a lot easier for businesses that want to make use of traditional currencies. This is another step toward making blockchain and smart contracts a real world reality for many businesses that perhaps have toyed with the technology, understand the theory, but have yet to really put it into action for live matters. Some of the other integrated services that you get. And that certainly seems to be the sticking point for blockchain applications. The tech is there now. There have been dozens of trials, pilots, experiments, dummy runs etc, but few mainstream, continuous, real life applications that become part of ‘business as usual’. So, anything that makes life easier, that can add ‘checkbox simplicity’ to running smart contracts on a private network would be a great step. 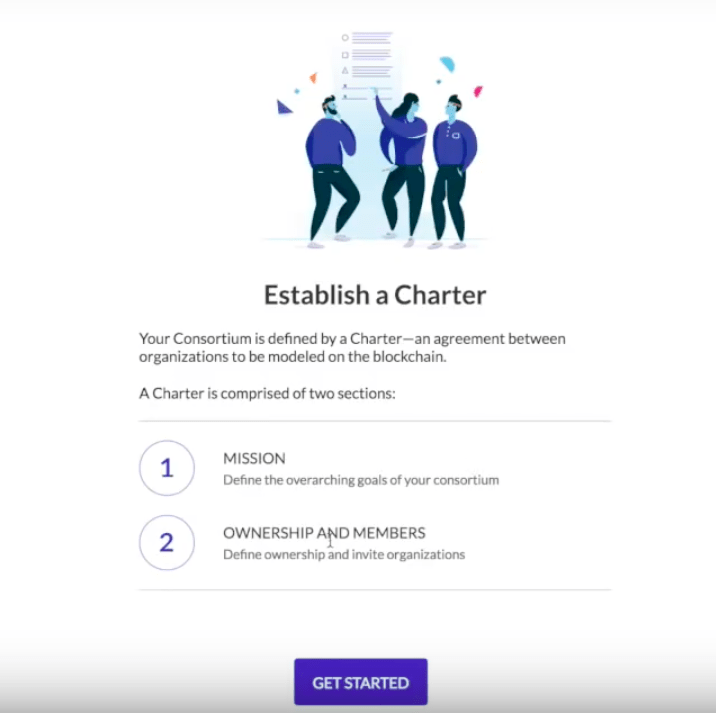 Establishing the charter of your very own network, one of the more fun and easy parts of the Kaleido process. Or, as Kaleido’s founder, Steve Cerveny, puts it: ‘With organisations becoming increasingly eager to capture this potential, why are we not seeing greater, faster enterprise adoption? To date it’s been a struggle to move experimental projects forward into live production networks. We are seeing lots of PoC and pilots but many are stalling or even quietly abandoned. But is this really going to work? Check out the short video below and see for yourself. Artificial Lawyer spoke to Clause’s co-founder, Peter Hunn, to find out some more. AL has watched the instruction video and it looks like the level of technical proficiency needed is still very high. I agree with that to a degree, but I would say that this is not really intended to be for non-developers. Kaleido is for technical users, in much the same way AWS is. [But,] users won’t really know they are using it. Clause, on the other hand, has always worked to make it easy for non-technical users. That’s why you don’t have to (if you don’t want to) see any code or markup. Drag and drop, like an e-signature block. Why is being able to create a private instance of Ethereum such a big thing? It means that you can spin up Clause to use on Ethereum just like you would do an app on iOS, for example. No nasty set up or technical knowledge required. What does being part of the marketplace mean? It means that users can set up Clause on Ethereum and Ethereum-based networks quickly and easily. Can’t users of Clause do all of this themselves already? They can use Ethereum with Clause and have been able to for a while. The difference is that now you can do all your technical set up via Kaleido and at the same time add Clause support. So, there you go. As noted above, if you’re not experienced in working in the blockchain field you’re probably not going to be able to knock together a private network overnight on your own, even with the great efforts to simplify things that Kaleido have made. But, if your firm has people who can get their heads around the mass of jargon and understand some of the technical aspects, then perhaps this could really speed things up and get people over the line into real, working uses of the tech, rather than just pilots. We’ll soon see whether this is taken up or not. Either way, it looks like a step in the right direction. That said, Artificial Lawyer is waiting for the day when building a private network is as simple as using SquareSpace to intuitively create a HTML website. And we will probably get there one day. 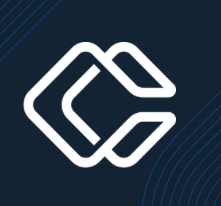 Chainlink ain’t just a crypto to fiat oracle – some the most crucial middleware in the game.